It's been a while since an art post has graced the blog and I thought it was long overdue. These days I've been stressing trying to think of a topic to write my Research paper about. I stumbled upon the 'Poesie' paintings by Titian that were painted for Phillip II of Spain which I found interesting. 'Poesie' (Poems) was how Titian himself described the artworks with them being the visual version of Ovid's Metamorphoses. There are several paintings in the series with Titian creating multiple versions of some of the paintings including this one, one in Madrid and the other in Rome. Venus and Adonis was designed to be viewed alongside Danaë with a Nurse, a painting from the same series with a related composition and are hung together. 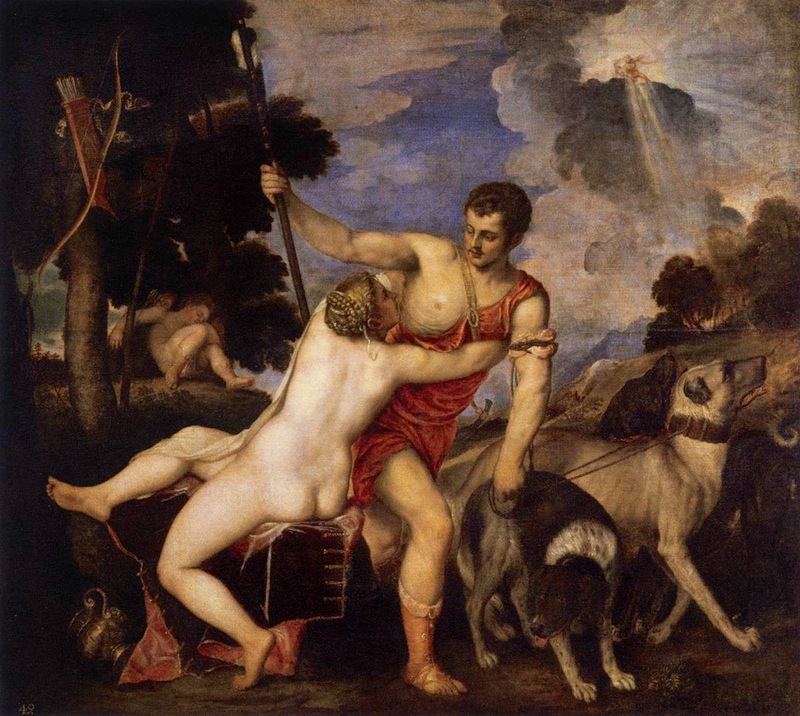 While the paintings are based on Ovid's work Titian did change some details in his paintings. The painting depicts Venus, the goddess of love who falls in love with Adonis, a beautiful youth. Her love however is not enough to stop him pursuing his favourite pastime, hunting, which will lead to his undoing as he is gored to death by a boar. The scene symbolizes the force of the hunt call which is a metaphor of life and of worldly affairs which is stronger than that of love (embodied by Eros, sleeping under trees on the left).